SIAM (Service Integration and Management) also known as MSI (Multi-Sourcing Integration), SMI (Service Management Integration), SI (Service Integration), SMAI (Service Management and Integration), SI&M (Service Integration & Management) ‘is a management methodology that can be applied in an environment that includes services sourced for a number of service providers’. It is actually one of the hottest topics in the ITSM world (maybe besides DevOps). Currently, there are only few good sources of knowledge (which I will present in the near future), mostly the knowledge of SIAM is proprietary for big sourcing companies, and is treated as their competitive advantage. So it is a good news that there is a new (and totally free) publication on the market called – SIAM-Foundation-Body-of-Knowledge which is accompanying certification provided by Exin. So, What you will find inside? Basic definitions, history, scope, … and sample models of SIAM (do not expect to much detail) – very good to provide consistent vocabulary. SIAM and Other practices – examples of enabling practices and their relation to a SIAM ecosystem (ITIL, ISO 20000, Lean, Cobit 5, DevOps, Agile). 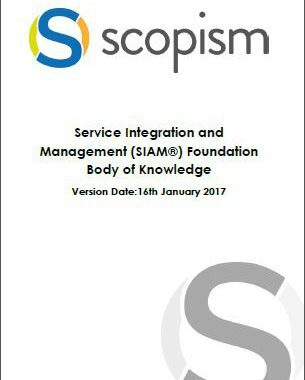 In addition to the SIAM-Foundation-Body-of-Knowledge, SIAM-Foundation-Process-Guides was also published, providing more detail consideration for process (mostly ITIL, but not only) implementation for SIAM ecosystem – if you have to deal with SIAM in practice, this the place you would probably like to start your journey with SIAM. The both documents can be downloaded from my blog (as it is free to redistribute) or to be sure that you have always current version – from the Scopism site.